Shinil Marine said last week it had discovered the wreck of the Dmitrii Donskoi, a Russian armored cruiser sunk in 1905 after fighting Japanese warships off South Korea's Ulleung Island, and that a staggering 150 trillion won ($130 billion) of gold was on board. However, the company backtracked on those claims on Thursday and apologized for having cited unverified news reports saying the ship held about 150 trillion won ($130 billion) worth of gold. "The reports said the Donskoi held 200 tonnes of gold but that would only be 10 trillion won at current value," said Shinil chief executive Choe Yong-seok. "We apologize to the public for the irresponsible citation." Critics noted that in 2003 another firm had already sparked a stock bubble by announcing the discovery of the Donskoi, which sank in a 1905 naval battle against Japan. 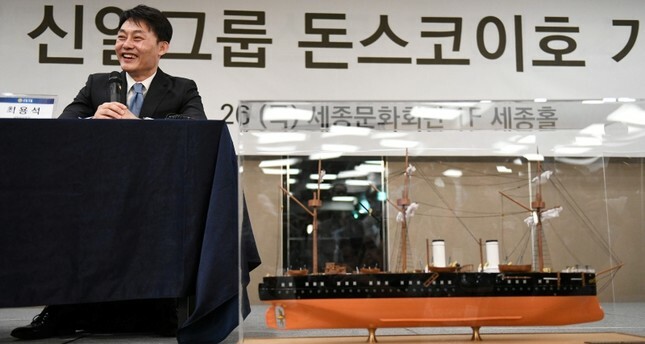 On Thursday Shinil said it may have gone overboard on the claims and apologized for the "misunderstanding", saying speculation on the value of treasure contained within the ship was based on news reports and unverified documents. Jeil Steel stock had hit 5,400 won ($4.82) but nosedived to around 1,785 won on Thursday, while Shinil replaced its board members and changed its name to Shinil Maritime Technology Co.
At the press conference, the company played a brief clip of underwater footage that appeared to show the ship, with the word "Donskoi" visible on the hull -- but it stopped short of entering the wreck. Shinil has yet to obtain government permission to raise the ship, which it said divers found more than 400 meters (0.25 miles) underwater off the eastern island of Ulleung. It's also unclear whether the company would able to claim ownership of the ship's assets even if it manages to retrieve them.